Today we are going to clean out our bags. For some of us this will only take 10 minutes, for others, a few hours. What bags should we clean out? Why are we cleaning out our bags during “Paper”month? Because I am sure there are both important and expired papers in your bags but do NOT just clean out the papers. Go ahead and clean out the entire bag. We want to “Control the Chaos” in 2016 and what better way to begin than “Controlling” the areas where they enter the home. 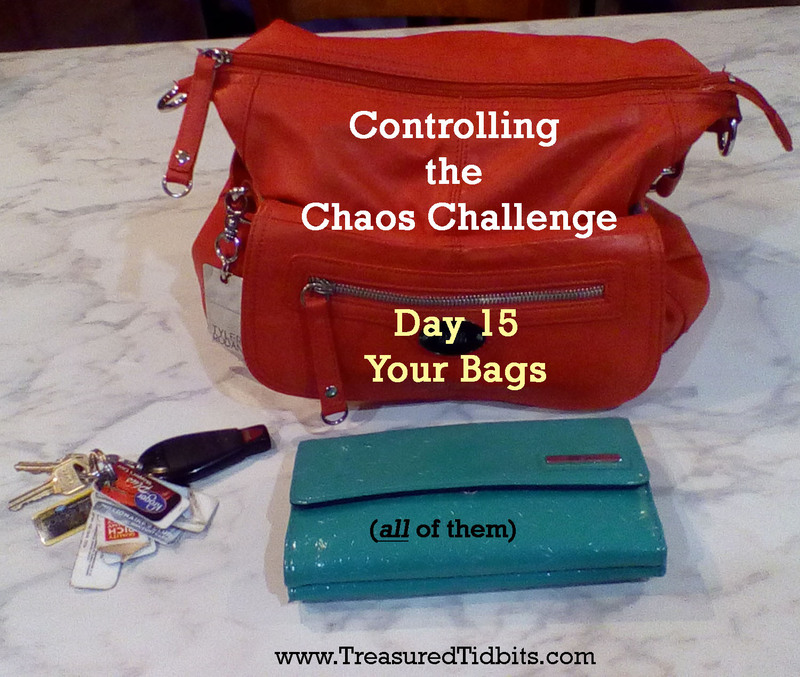 If your bags are clean and organized now, you can start the year off in control and THAT is EXACTLY what we want. 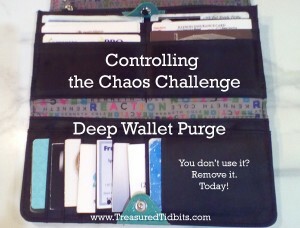 (I have it on my weekly checklist in order to make sure it gets done and my receipts get scanned for extra savings.). What are some of the things you should do while cleaning out your bags? 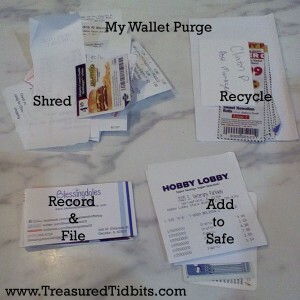 Remove expired insurance cards, rewards cards and coupons. 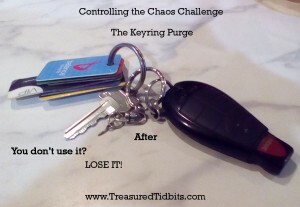 Remove old keys from your key ring. (We had three keys on our ring and two were to a house that burnt down almost two years ago). That’s.just.sad. 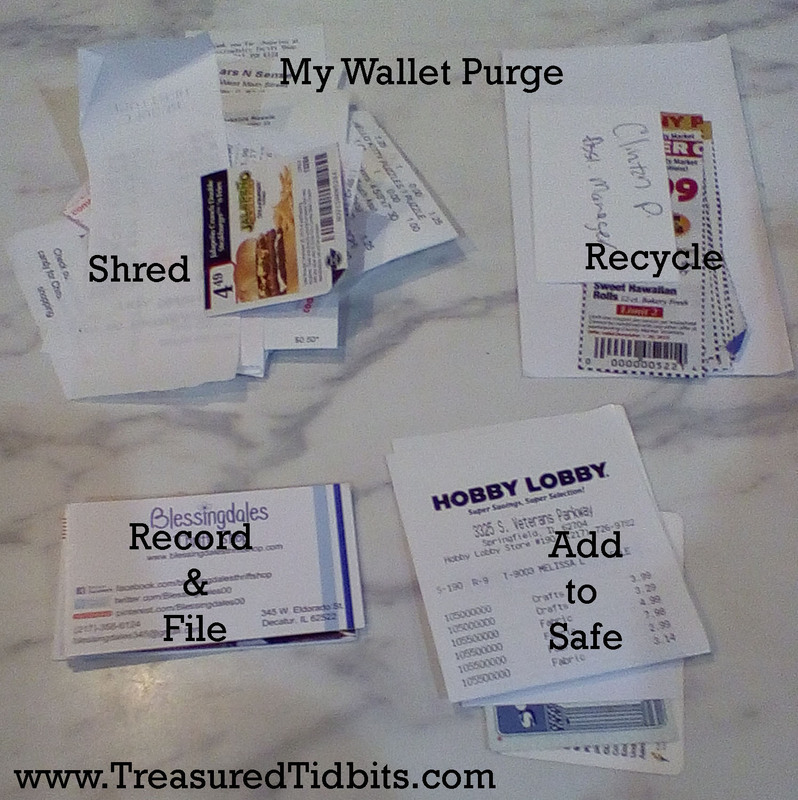 Scan or file all coupons, papers and receipts in your newly organized systems. 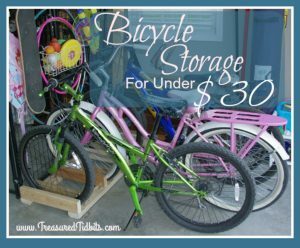 Replace broken or damaged items. Remove doubles, triples and questionable items. Do you really need 27 ink pens? Seriously analyze every, single item before you return it to your bag. 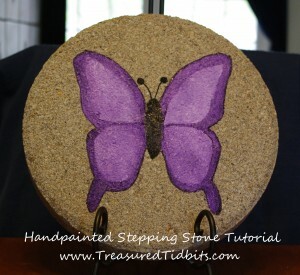 Because I knew I would be gone today for appointments and out of town errands I chose to do this project last week. Just for encouragement I will share our results. I don’t carry a “real” purse due to my physical challenges and I empty it every time I return home because the more weight it has the more pain I have. I don’t like pain so I decided long ago to keep my purse as light as possible. Confession: The purse in the photo is full of socks and only used as a prop BUT that is my wallet and keychain. (I won’t show you how we cleaned out the socks, lol). 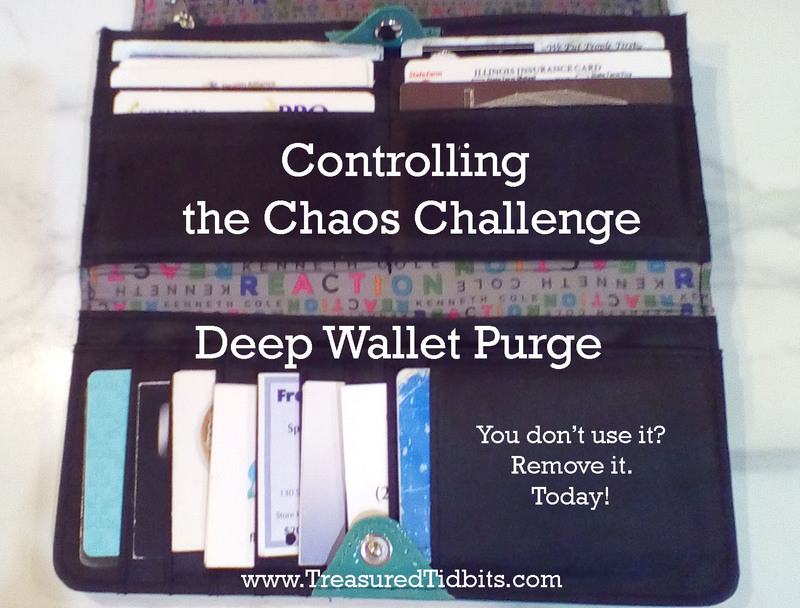 This is the after photo of my wallet. There is still quite a bit I am keeping, I just wish more of it was cash. THIS is what came out of my wallet and went away. Yes, we are even purging our keycards. The ones on the left either expired or the stores in our area closed. The ones on the right I use regularly. 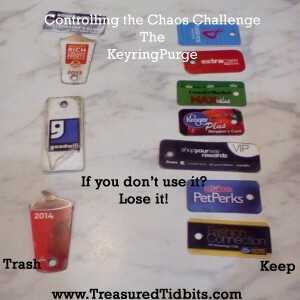 I do not have a smart phone but I have heard that you can scan your card and use your phone at the checkout if you don’t wish to carry the key cards around. My key ring after. One key and much fewer key cards. I must confess, checkout has been much quicker since I am digging through 4 less cards. How are your bags coming? Did you make it through them all? Did you remember to scan the receipts for the reward programs or put them in the take action file to handle on Sunday? Did you find anything exciting? Spare cash? Loaded gift cards? A bill you forgot to pay? 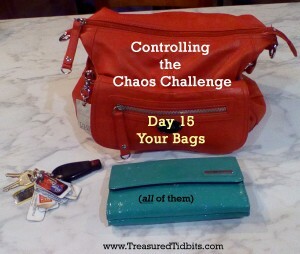 Remember today is a new day and you CAN “Control the Chaos” even in your purse, briefcase and diaper bag. 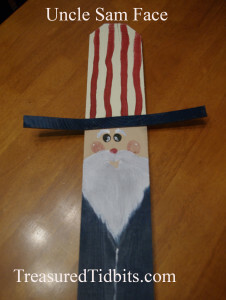 If you would like to follow the blog please follow us on Facebook, Instagram, and Pinterest. Want to find support from others like us? 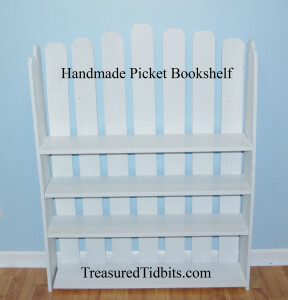 Join our private Facebook Group at Clutter Overcomers. I am the absolute worst about cleaning out my purses. It is something that I worked on correcting last year, although I am not there yet. Thanks for the reminder that it is more convenient not to have junk in your way. Thanks for the reminder not to forget the bags when cleaning up. I will be adding this to my regimen (and cleaning out several tomorrow!). Oh, yeah, and gotta get those updated insurance cards added. Very important! It drives me nuts when a certain family member decides to “help” clean out our van and tosses everything into one bag. Trash, items that stay and of course items that go and then brings to to me to “deal with”.